It's natural to want to 'beat the street' and get the winning edge in your investing. Trying to cut corners never works, and hunting for a one-size-fits-all 'magic formula' is only bound to end up in financial disaster. You're better off with proven ideas based on thorough research – the ones that work year after year and decade after decade. One of the best practices that would fit into this category is dividend investing. It's impossible to argue with the facts and the numbers, which consistently favor dividend investing over most other types of investing. There are companies that have been paying out dividends to their investors for over a century; these are the dividend achievers that recognize the value of rewarding their shareholders. When companies consistently raise their dividends on a percentage basis, quarter after quarter, then you've got a true dividend aristocrat and that's the type of investment that makes me happy and confident. Don't misunderstand what I'm saying: I'm not against companies reinvesting some of their net profits back into the company itself. There's certainly value for shareholders when companies use some of their proceeds for research and development, marketing, and so on. That's why I don't expect all companies to have huge annual dividends in the ballpark of 5% or 10%. Really, 2% or 3% can be perfectly acceptable – it all depends on the company and the market environment. If 2% or 3% doesn't sound attractive to you, then bear in mind that currently the annual yield for a 10-year Treasury bill (i.e., a U.S. government bond) is less than 3%. So if you're invested in a great company whose stock shares tend to go up over the long run, plus they pay out a dividend, then you're very likely to outperform with that stock versus what the bond would pay you. And if you reinvest your dividend cash payments back into the stock shares, then you're using the power of compounding and you're really firing on all cylinders when you do that. You'll see some very familiar brand names on there, which should come as no surprise because dividend achievers are superior businesses, plain and simple. It's not a 'race to the top' with dividend payouts; a company that pays a 10% annual dividend isn't necessary any better than a company that pays a 3% annual dividend. Rather, it's a matter of taking an already great company and making it better by rewarding long-term shareholders with regular cash payouts. 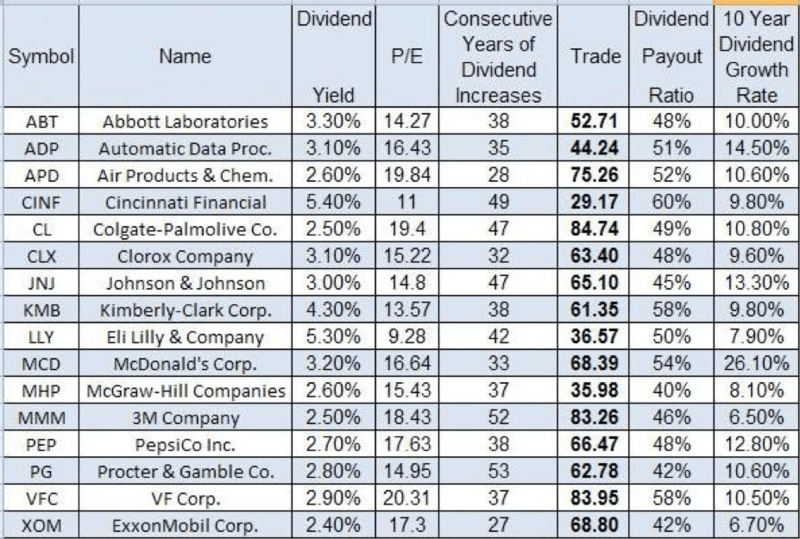 You might also have noticed from the table above that these great companies all have increased their dividend payments (in percentage terms) for many consecutive years. This type of activity will give investors confidence that they will continue to reward shareholders far into the future. As we can see, the research and the statistics plainly show the advantages of dividend stock investing. No matter what the Treasury interest rates have been in the past, and despite all market conditions, dividend investing has consistently been a winning method. Courtesy of Lombardi Publishing Corp. Certainly, the Great Recession was hard on the equities markets, but notice how much higher the dividend aristocrats rebounded compared to the overall market (as represented by the S&P 500). Stock market investors cannot avoid volatility altogether, but the effects of market fluctuations can be mitigated somewhat by investing in great, time-tested companies that not only pay out dividends, but also raise those dividend payments on a consistent basis. As they say, the numbers don't lie, and it's clear what the numbers are saying about dividend investing. We are glad to bring you the irrefutable evidence and the good news that dividend investing is a fantastic long-term strategy for your portfolio. TICKET TO WEALTH: Dividend Stock Investing Can Work for You!